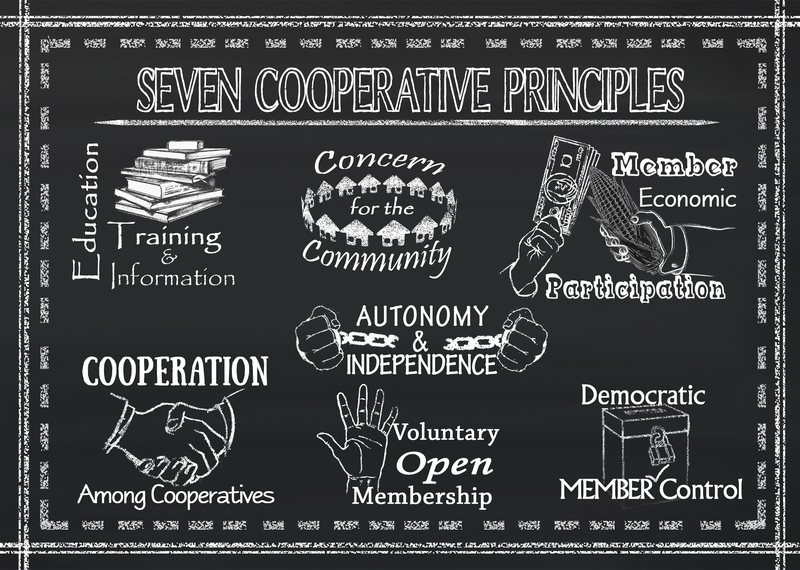 A cooperative is a business that is owned and controlled by its members. The cooperative is operated to benefit its members, not to maximize profits for outside investors. People who use the cooperative own their cooperative because they finance it in a variety of ways. They share in both the business risks and the business profits. Each cooperative determines what level of financial participation is required to establish membership status in the co-op. Members democratically control their cooperative by exercising the voting rights that come with membership. In Wisconsin, each member is entitled to one vote. Members benefit for the cooperative because they have access to the products and services that they need. Net earnings are distributed on the basis of proportional use, or patronage, rather than on investment. The funds needed to start and operate any business can be in the form of either equity capital or debt capital. Debt capital refers to loans, bonds or credit that is borrowed from banks, other financial institutions, members or individuals that must be paid back to the lender with interest over time. It does not give the lender ownership rights. Equity capital is money invested in an enterprise with no guaranteed return. Equity investors typically receive some level of ownership and control, and a share of the business's profit, because equity capital is at risk if the business is not successful. In the case of a cooperative, members, as owners, provide equity capital in proportion to their use of the cooperative. It is part of members' obligation as owners to share in business risk as well as business profitability. Cooperatives raise equity capital from members in several ways. While this typically is a requirement for membership, it is not a significant source of ongoing equity capital for established cooperatives, nor the primary source for start-up capital for a new co-op. When larger amounts of capital are needed for start-up or expansion, cooperatives may sell preferred stock to members and non-members. Preferred stockholders may receive dividends based on the performance of the cooperative and the approval by the board of directors. Most state cooperative statutes limit dividends at 8% or under. To meet the ongoing need for capital, established cooperatives, like other businesses, will reinvest some portion of annual net profits back into the business. In the case of a cooperative, this type of equity can either be allocated or unallocated. Allocated equity is the portion of the annual net profit that is credited to each member's account based on the member's use, or patronage, of the co-op that year. Allocated equity is distributed in several different ways, depending on the cooperative's capital needs, its tax position and type of business. The portion that is distributed back to the patron is often referred to as the patronage refund. Allocated equity rarely earns interest for the members. However, there is the expectation that the cooperative will redeem allocated equity at some point in the future, based on a redemption plan developed by the board of directors. Equity redemption plans can be one of the most challenging aspects of cooperative finance. A portion of the net profit may also be designated as unallocated equity. Unallocated equity is not credited to individual member accounts, and is directly reinvested in the cooperative, which is responsible for the taxes. Another source of unallocated equity is from the profits earned by doing business with non-members. Per unit retains is another way for members of agricultural cooperatives to contribute equity to the co-op. The cooperative retains a portion of each transaction it makes with a member for products received or purchased. The retained payments are credited to a member's equity account, and are treated similarly to allocated equity accounts. As with allocated equity, the cooperative is obligated to redeem this equity at some point in the future.